In my last post, I showed how the climate change activists were once again moving the goalposts, because they realized that critics could use the IPCC’s own reports to challenge the case for aggressive government intervention against carbon dioxide emissions. However, the discussion in that post relied on earlier versions of the IPCC reports. In honor of today’s UN Climate Summit in New York City, I thought it appropriate for me to go through the most recent IPCC report—the Fifth Assessment Report or “AR5”—and once again show that using their own numbers, there is no case for aggressive government action against emissions. Before I dive into the details, let me outline my overall strategy: I am going to show that the IPCC’s own projections show that the likely economic costs of aggressive government action to slow emissions will be higher than the likely reduction in climate change damages that this policy action will yield. In other words, I will show that the IPCC’s middle-of-the-road estimates (for their best guess as to what will actually happen) show that the costs of government action to mitigate climate change are higher than the benefits. Let me stress one subtlety: To make good decisions, we need to look at the marginal costs and benefits of government policies. In this case, it’s not correct to compare the economic costs of, say, a carbon tax, against the total climate change damages in the “do-nothing” scenario. Rather, to see if a particular carbon tax is justified on cost/benefit grounds, we need to look at the costs of its implementation compared to the reduction in climate change damages that it produces. Keep in mind that even with a high carbon tax, the globe will keep warming, and will—according to the IPCC models—begin experiencing net damages from climate change. To repeat, that’s why we must compare the economic costs of a carbon tax (or other anti-emission policy) against the reduction in climate change damages, not against the total damages in a no-policy baseline scenario. The IPCC itself doesn’t dictate what specific goal policymakers should adopt. However, for those familiar with the policy debate, it is commonplace for pundits and many experts to recommend a goal of limiting total global warming to 2 degrees Celsius. (For example, here’s a ThinkProgress post from 2009 explaining why the 2-degree limit is so crucial as a focal point of the debate.) And to be sure, there are many, many activists who push for a far more aggressive goal, such as limiting the temperature increase to 1.5 degrees (which makes a huge difference in compliance costs). Thus, by picking 2 degrees as the policy goal for this blog post, I am by no means attacking a straw man or stacking the deck against the interventionists. This is a quite “moderate” goal in their book. Yet, as I’ll show in the rest of this post, using the IPCC’s latest AR5 report, I can demonstrate that such a policy would impose more harm on the economy than it would deliver in benefits from a reduction in climate damages. What Does IPCC Say Are the Economic Costs of a 2°C Limit? Now that we’ve picked a policy goal to evaluate, let’s first use the IPCC AR5 to estimate the economic costs of its implementation. Remember, the free market outcome (according to the computer models that the IPCC uses) has emission growth such that the globe will warm more than 2°C if the governments of the world don’t take action. Therefore, by limiting emissions (through carbon taxes, cap-and-trade, or direct regulations) the governments of the world will force businesses and households to do things differently. This imposes economic harms, because you don’t need to force businesses to do things that are profitable. As the above block quotation demonstrates, the latest IPCC report indicates that if the goal is to limit global warming to a maximum of 2°C (relative to pre-industrial temperature) during the 21st century, then policymakers must aim to stabilize atmospheric concentrations of CO2 at or below 480 parts per million (ppm) by the year 2100. Since we know that our 2100 Concentration target is 430 – 480 ppm, we need to look at the top row in the table above. The light gray columns show us that the IPCC projects economic compliance costs of 3.4 percent of global GDP in the year 2050, and that these costs rise to 4.8 percent of GDP by the year 2100. Note that these numbers are the middle of the range shown in parentheses. For example, in 2100 the table above shows that the desired concentration target could in fact have compliance costs ranging from 2.9 percent all the way up to a whopping 11.4 percent of GDP. Let’s pause and review what we’ve already found: In order to be confident of limiting global warming to 2°C, the IPCC AR5 is telling us that governments around the world will need to implement policies that reduce conventional economic output by 3.4 percent in the year 2050, and 4.8 percent in the year 2100. In order for the climate policy goal to make economic sense, therefore, it sure better be the case that the IPCC report shows that a 2°C limit on temperature change will correspond to a reduction in climate change damages of at least those amounts in the years 2050 and 2100 respectively. So let’s see what in fact the IPCC says. In the figure above, we need to use the right-hand scale since we’ve been working with global warming relative to pre-industrial levels. The figure shows that even in the most pessimistic pathway (RCP8.5), global warming by 2050 is around 2.5°C and by 2100 is around 4.5°C. Remember, these figures are for the “worst case” that the IPCC outlined. So if their figures don’t show a compelling reason for strong government action here, they certainly won’t be justified in general. Finally, What Does IPCC Estimate as the Climate Damages From Warming? SOURCE: Table 10.B.1, IPCC WGII AR5, p. 82. The first thing to note is that most of the studies only estimate damages from modest amounts of global warming. 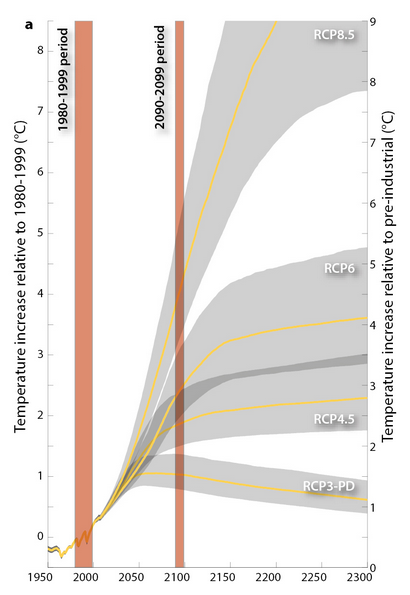 Notice that for temperature hikes of 2.5°C or less, the estimated global damages are at most 2.5 percent of GDP—in particular, that estimate comes from Plamberk and Hope’s 1996 estimate. Already, we can conclude that as of the year 2050, the chosen policy goal (of limiting the global temperature increase to 2°C) massively fails a global cost/benefit test, using the IPCC numbers. Remember, in the previous section we showed that even in the “worst case” pathway, the globe would only warm by 2.5°C by the year 2050. 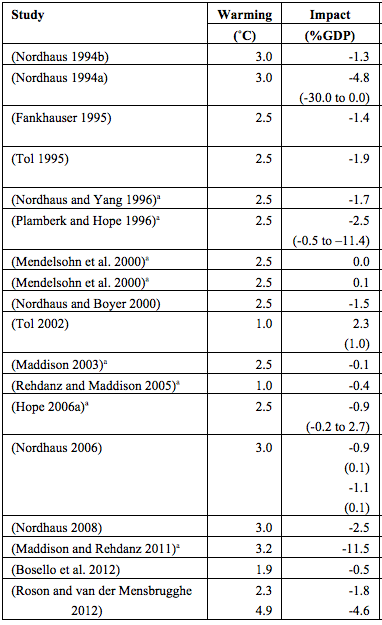 The table above shows us that the total damage from this warming is at most 2.5 percent of GDP. Therefore, even if massive intervention somehow eliminated all climate change damage—which it wouldn’t—then at best it would spare the globe 2.5 percent GDP of damage in the year 2050. And yet, we already know from our table with the gray shading earlier in this post, that the economic compliance costs of our policy would be 3.4 percent of global GDP in the year 2050. So to sum up so far, it’s not even close to try to justify our chosen policy goal, using the IPCC’s numbers, through the year 2050. The economic compliance costs of the policy are higher than even the total damages of global warming, even in the worst case scenario. So clearly the compliance costs are higher than the reduction in climate damages that this policy would deliver. Okay, but things may look better for the climate activists if we go out to 2100. Yet unfortunately, as the table above shows, there are scant estimates for global damages with warming above 3.0°C. Remember that we’re supposed to be looking at the damages from a 4.5°C warming, since that’s what the figure showed would happen in the “worst case” (i.e. RPC8.5) concentration pathway by the year 2100. There is only one study that the IPCC table lists with such an estimate, namely the bottom one, Roson and van der Mensbrugghe’s 2012 study. As the table shows, they estimated that a 4.9°C warming would cause a 4.6 percent reduction in global GDP. Uh oh! Remember from the table way in the beginning—the one with the gray shading—that the IPCC estimated a compliance cost of 4.8 percent of GDP in the year 2100 from our chosen policy. Therefore, if we relied on the one study that the IPCC lists to give us an estimate of the damages from the projected warming under RPC 8.5 by the year 2100, then we conclude that our policy can’t possibly be justified. Even if our policy completely eliminated climate change damages—which it wouldn’t—the economic compliance costs would still be higher in the year 2100. →First we quoted from a ThinkProgress post to establish that a quite “moderate” policy goal in the climate change debate is to limit global temperature increases to 2°C, relative to pre-industrial times. There are many activists who want an even stricter limit, such as limiting global warming to only 1.5°C. That is the policy goal we evaluate in the post, to see if the IPCC’s own numbers can justify it in cost/benefit terms. →Next we quoted from the IPCC AR5’s Working Group III report to show that in order to “likely” limit global warming to 2°C in this century, atmospheric concentrations of CO2 (and its equivalent) must be stabilized at or below 430 – 480 parts per million (ppm) by the year 2100. →Next we quoted again from Working Group III to show that these targets for atmospheric concentration by the year 2100 would require government policies that reduced global consumption by 3.4 percent in the year 2050 and by 4.8 percent in the year 2100. 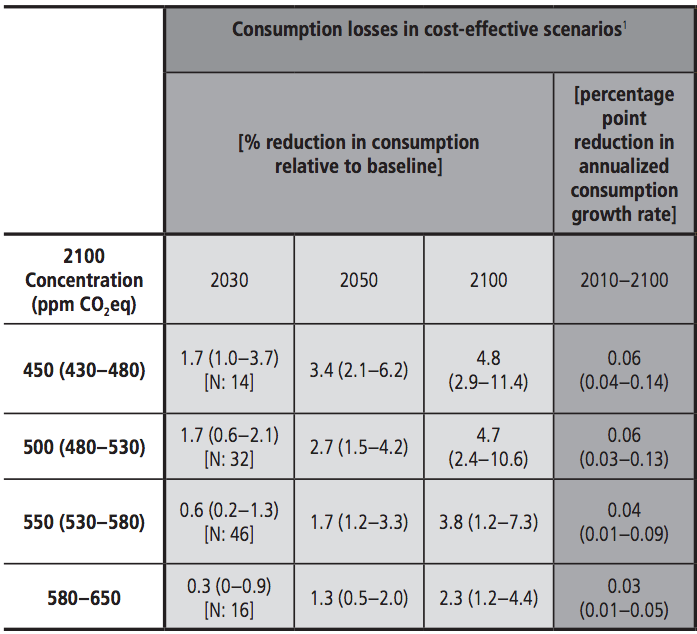 These are the IPCC’s latest estimates of the economic costs of meeting the climate objective. To be sure, most of the natural scientists and economists involved with the IPCC report desire some type of government intervention to limit emissions. Nonetheless, in this post I have just shown that using the latest IPCC AR5 report, I can make a very convincing case that a popular climate goal—limiting global warming to 2°C—isn’t even close to being justified by the year 2050, and even by the year 2100 cannot be justified using the scant evidence in the IPCC report. This is because—using the IPCC’s own projections—the economic costs suffered by businesses and households to comply with emissions reductions exceed the estimated environmental damages from warming. Thus the “moderate” policy goal fails a global cost/benefit test, using the very source of information that the climate change activists tell us represents the established science. Despite this incredibly “inconvenient truth” about the published science and economic estimates, I imagine the media coverage of the UN’s New York City climate summit will make reference to the “settled science” and “consensus” in favor of massive government intervention. One almost gets suspicious that politics are involved. Technically the IPCC table refers to “consumption losses” rather than “GDP loss,” but for our purposes this distinction is minor. In fairness, I should admit that the Maddison and Rehdanz 2011 study—which projects a whopping 11.5 percent GDP loss from 3.2°C of warming—would almost surely make our policy goal pass a global cost/benefit test. However, there are two things to point out: First, this estimate is clearly a far outlier compared to the other listed studies. Second, strictly speaking we still don’t have enough information to conclude that the policy is justified. We would need to know the difference in global damages from 2°C versus 4.5°C, and compare that number to 4.8 percent of GDP, which is the compliance cost of the policy. To repeat, I am sure the number would be high enough, but strictly speaking the IPCC doesn’t give us enough information to make that judgment. It’s interesting that we have to bend over backwards and speculate as to whether we could use the IPCC’s own figures to justify a popular climate policy goal. What Will EPA’s Final Decision Be on the RFS?